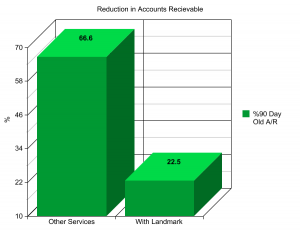 PROBLEM: High percentage of 90-day-old accounts receivable. The billing service was not following up on insurance payments. They were not matching up Explanation of Benefits (EOB’s) with payments. The billing service was not billing secondary and tertiary insurances (many do not). This created larger co-pays due that left many patients angry. Insurance claims were not being sent electronically. Use of incorrect diagnosis and incorrect procedural codes increased insurance rejections resulting in slower payments. Landmark Billing Services, Inc. took over each of the problematic accounts and entered all of the patient’s history, demographics, and charges into their computers. This action served as an audit check for accurate information such as addresses, codes, and charges. All EOB’s were matched up with payments. All insurances including secondary and tertiary were re-billed. Claims were sent electronically (Payments are made much faster). Patient statements were sent for only three months, even if there was still a balance due and the patient was making timely payments. Patient statements were not mailed at all which created old accounts that were turned over to a collection company. The fee charged was then 35% for collections instead of 8% for billing services. The billing service made little effort to use correct addresses or to contact the patients and/or provider’s staff to obtain the correct addresses. All patients with balances due were sent statements to correct addresses. Patient accounts were monitored on a weekly basis to preclude slow payment. All patients that made no payments for 60 days were called and payment plans were worked out.